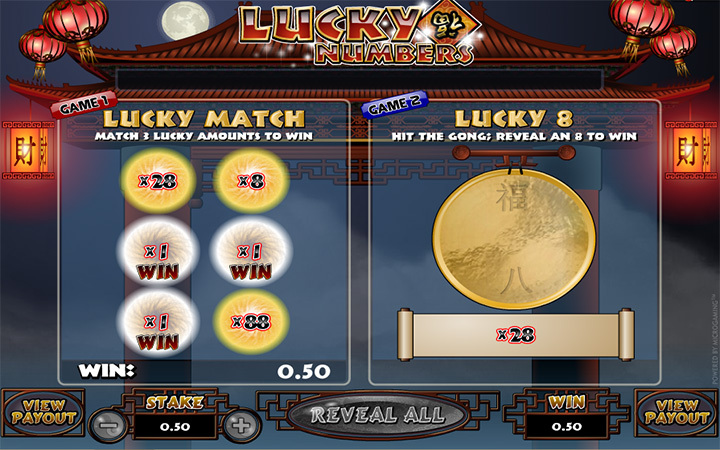 Lucky Numbers scratch card game is an innovative example of this genre, if you can believe it. Usually, scratch card games are simple and pretty straightforward titles, scratch the card – match two symbols – get paid. There is not much room for innovation but it seems Microgaming managed to do exactly that. Lucky Numbers consist of two separate games, which increases your chances of winning and excitement. As you can see, there are two sections in the interface. To the left, we have a classic scratch card game. All symbols look like gongs, the only thing that differs is the multiplier values on top of them. You can see numbers like x1, x8, x28 and x88 – these mean that you get to win that multiplier value for your bet, if you manage to match two same symbols in a single round. Start by setting your bet: this value will represent how much money you spend for each card. You can set this value between 0.50 and 10.00 coins. After that, just press the “new card” button. You need to scratch six different symbols to the left, but you can also click on “reveal all” button too if you don’t want to waste time. As we mentioned above, if you manage to find two symbols with the same multiplier values, you get that value multiplied by your bet as the prize. The highest payout of the game is 8888X your bet, which means you can win 88.880 coins in a single round if you play with the maximum bet values. As you can see, playing with higher bet levels is important in these games since the payouts are in form of multipliers. To the right of the interface, there is a single, big gong symbol. This means that you have one more try if you weren’t successful in the left section. 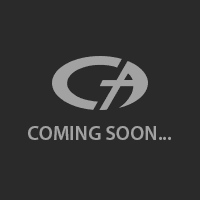 If you scratch this big symbol and get an “8”, you win 88X total bet. (Again, if you are playing with the maximum bet values.) In other words, the game offers two winning chances in one round, which is a nice feature. Highly recommended if you are interested in playing scratch card games, the overall payout values and the extra winning chance are what makes the game differ from the rest.